For some reason God is fighting Jesus in this movie. 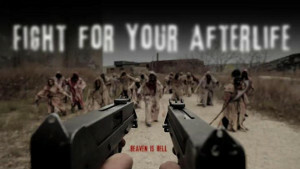 Heaven is Hell looks like a futuristic rendition of a heavenly battle set on Earth complete with guns, technology, and of course, zombies. While the concept reel for this thing looks utterly horrendous, I have to say the production design, especially the God Chamber looks stunning so I'm real hopeful. It's still in production and we have a couple stills below. Two factions, one led by God, the other, Jesus, desperately fight for control of Heaven. When God and the archangels score a devastating victory against Jesus, a group of rogue apostles unite to resurrect their savior, and make one final campaign to defeat God and expel him from his heavenly throne. Seriously? Why put Jesus in Satan's role? And before you say there is no God, no Jesus, no Satan, no Heaven, or no Hell, there is a book called the Bible, and one of its themes is basically Satan vs God. So I'll ask again, why put Jesus in Satan's role? You just made a quantum leap to an incorrect conclusion. Jesus is not in Satan's role. See the film when it comes out. It works. After an untimely death, Faith wakes up in an overgrown, creature-ridden wasteland which she soon discovers is Heaven. She is greeted by a team of apostles who are in a constant battle with Zerach, an evil archangel who has usurped God's power and enslaved him, and in a constant search for Jesus to take up arms with them and reclaim the throne of Heaven.